What will it take to land heavier spacecraft on Mars? How will engineers slow large payloads traveling at supersonic speeds in a thin Martian atmosphere? Can this be done? NASA's Wallops Flight Facility is playing an integral role in potentially answering those questions with the Low Density Supersonic Decelerator mission, or LDSD. To conduct advanced exploration missions in the future and safely land heavier spacecraft on Mars, NASA must advance the technology of decelerating large payloads traveling at supersonic speeds in thin atmospheres to a new level of performance. The current technology for decelerating payloads dates back to NASA's Viking Program, which placed two landers on Mars in 1976. That same technology is still being used and most recently delivered the Curiosity rover to Mars in 2012. Future robotic missions to Mars and even future human exploration will require more massive payloads than previously sent to the surface of the Red Planet. To accomplish these goals, NASA is developing new systems to deliver this important cargo to the surface of Mars. NASA scientists and engineers borrowed a technique used by the 'o'opu hue, also known as the Hawaiian pufferfish. The technique? Rapid inflation. For the pufferfish, it is simply a defense mechanism. For NASA, it is potentially the element that links to the future of space exploration. Set for a test launch in early June from the Pacific Missile Range Facility in Hawaii, LDSD will use a 20-foot diameter, solid rocket-powered balloon-like vessel called a Supersonic Inflatable Aerodynamic Decelerator (SIAD) to test these capabilities. To duplicate many of the most important aspects of Mars' thin atmosphere, NASA plans to use the very thin air found high in Earth's stratosphere as a test bed for the LDSD mission. To reach the desired altitude of 120,000 feet, the LDSD project will use a helium-filled scientific balloon provided by NASA's Wallops Flight Facility and Columbia Scientific Balloon Facility. When fully deployed, the balloon itself is over 34 million cubic feet. At that size alone, one could fit a professional football stadium inside it. The material that makes the balloon, a very thin film called polyethylene that is similar thickness to that of sandwich wrap, will lift the massive test article to 120,000 feet. At that altitude, the test article will be detached from the balloon and a solid rocket motor will be employed to boost the test article on a trajectory to reach supersonic speeds (Mach 4) needed to test the SIAD. Once at supersonic speeds, the deployment and function of the inflatable decelerators will be tested to slow the test article to a speed where it becomes safe to deploy a supersonic parachute. The balloon and test article will all be recovered from the ocean. Two recovery vessels, Kahana and Konua, will recover the test article and balloon respectively. Before the articles can be recovered, a G-2 and a C-26 aircraft will focus on determining positioning of the articles for recovery. Wallops, with extensive experience vehicle recovery, will oversee the recovery operations for the LDSD mission. In addition to the balloon operations and oversight of recovery, Wallops is the range services coordinator, has provided the core electronics for the test article and electrical ground support equipment. NASA has identified six potential launch dates for the balloon carrying LDSD: June 3, 5, 7, 9, 11, and 14. The June 3 launch window extends from 8 a.m. to 9:30 a.m. HST, or 2 p.m. to 3:30 p.m. EDT. NASA's Space Technology Mission Directorate in Washington funds the LDSD mission, a cooperative effort led by NASA's Jet Propulsion Laboratory in Pasadena, California. 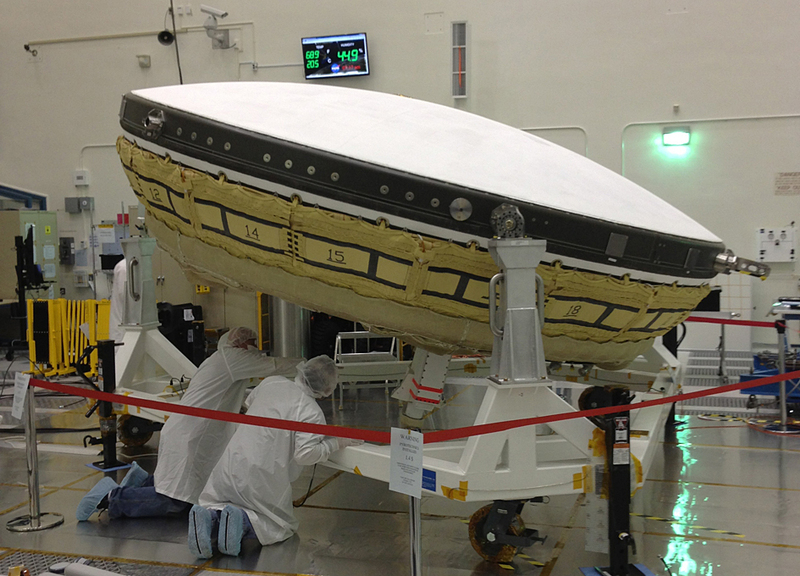 JPL is home to the LDSD project manager, Mark Adler, and its principal investigator, Ian Clark. NASA's Marshall Space Flight Center, in Huntsville, Alabama, manages LDSD within the Technology Demonstration Mission Program Office. NASA's Wallops Flight Facility in Virginia is coordinating support with the Pacific Missile Range Facility and providing the balloon systems for the LDSD test.